In 1859 the Royal Engineers began work on a system of moats and defence batteries at Stokes Bay stretching from Gilkicker Lake and Fort Monckton in the east to Browndown in the west, a distance of 2,700 yards. The moat was the last stage in a defensive system of forts that was to protect Portsmouth harbour from an overland invasion on its western approach. Stokes Bay had a fine shelving beach and the military Defence Committee recognised that it was a good place to land a large force of troops intent on capturing the dockyard in order to establish a beach head, prior to a full scale invasion of England. The Stokes Bay Lines were completed by 1870 at a cost, calculated in a report of 1869, to be £75,120. The moat, known as the Stokes Bay Lines, consisted of a rampart constructed entirely of earth with a firing step for riflemen behind. On the seaward side of the moat was a sentry path with another firing step. 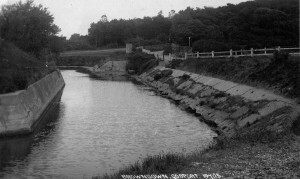 The moat itself was lined with concrete and was 60ft in width and containing water to depth of 9ft at high water of Spring tides. 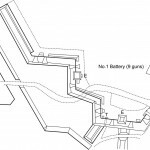 The moat was defended by five flanking batteries of various traces intended to contain a total of 40 guns. In some places the Stokes Bay road ran to the rear of the rampart whilst in others it crossed over via a drawbridge and ran in front. No.1 Battery at the western end straddled the road from Gomer to Browndown and Lee. A tunnel through its rampart and a bridge allowed access to the parade of the No.2 Battery, which was further south. 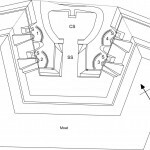 No.2 Battery consisted of a sea facing high rampart to mount guns that could dominate the beach and a casemated set of three gun chambers to fire down the moat towards the east. A large range of earth covered casemated barracks held guns that fired westwards over Browndown. 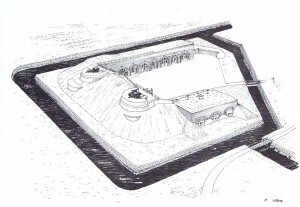 No.2 Battery was completely encircled by the Stokes Bay moat. 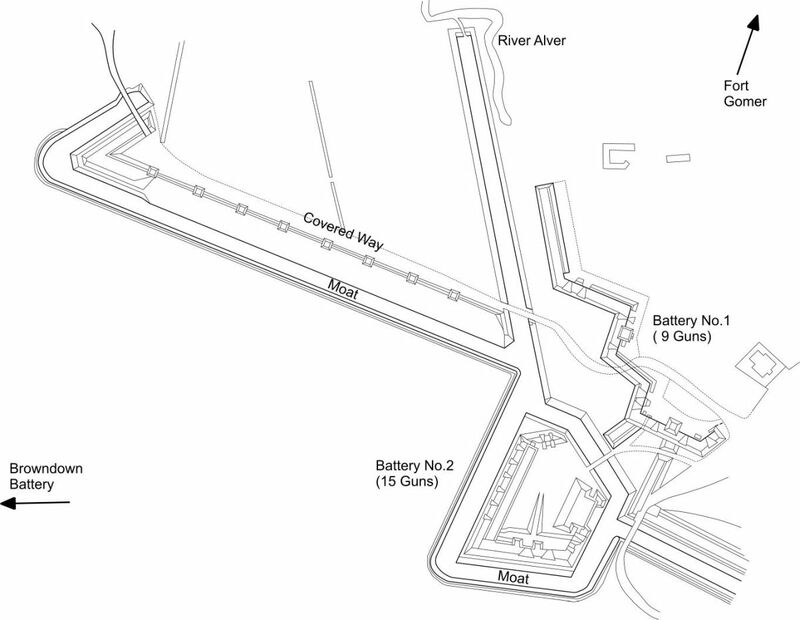 No.3 Battery was built at the southern end of Village Road (now the southern end of Jellicoe Avenue) with guns firing back along the length of moat from No.2 Battery. Here the moat turned south and was crossed by the Stokes Bay Military Road. The moat then turned eastwards once more and ran along parallel to the military Road to the junction of Anglesey Road. 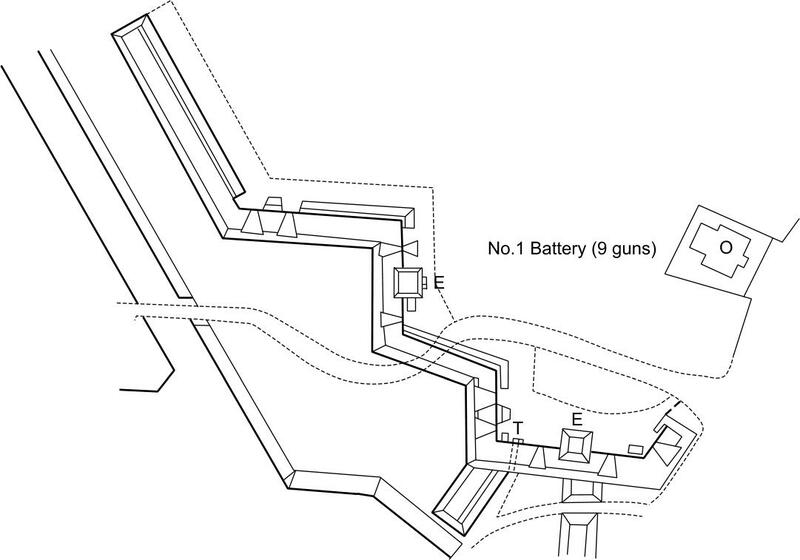 No 4 Battery held guns to fire along both branches of the moat, east and west. The moat ran on from here straight to the Lake at Gilkicker which was the water defence for Fort Monckton. No 5 Battery sat behind this length of the moat with sea facing and flanking guns. 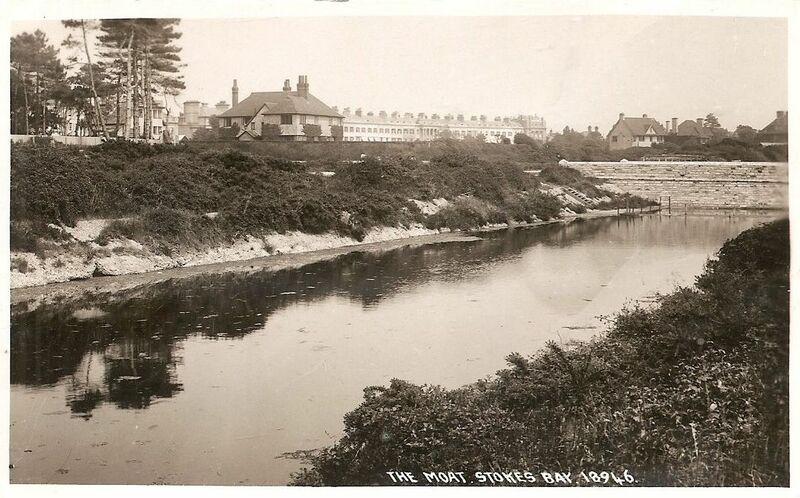 In order to maintain the water levels in the moat the Royal Engineers diverted the River Alver into it. 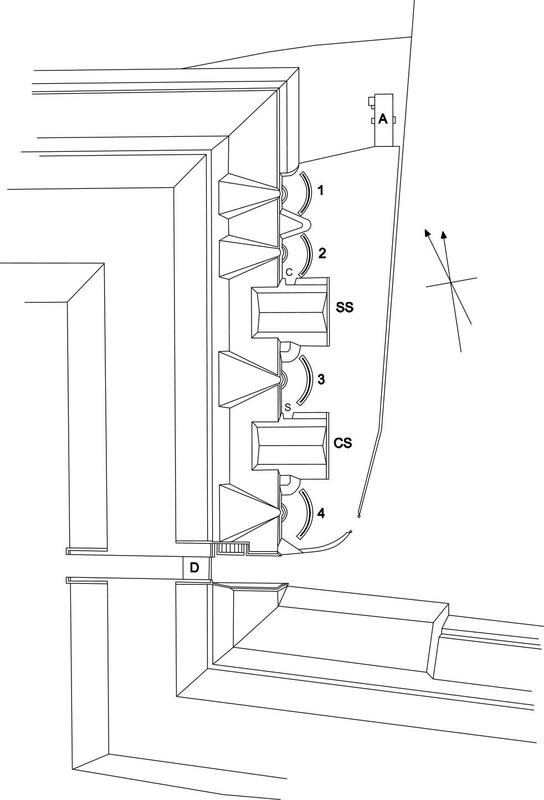 A major sluice at the seaward side of No.2 Battery allowed the levels to be adjusted. 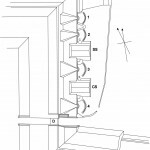 Penstocks at various points along its length allowed fine adjustment to be made to the water levels. The Victorian forts and coast defence batteries were to be manned by the Garrison Artillery supplemented by Volunteer Artillery. 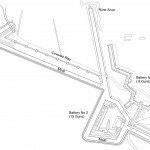 Gunners for manning the batteries of the Stokes Bay Lines were quartered in Fort Gomer as the batteries themselves had no barracks (apart from a small contingent at No.2 Battery) for permanent troops. When constructed the batteries were to be armed by a mixture of smooth bore guns but by the 1870s all of the batteries were armed by the 7-inch Rifled breech loading gun, know as the Armstrong Gun. 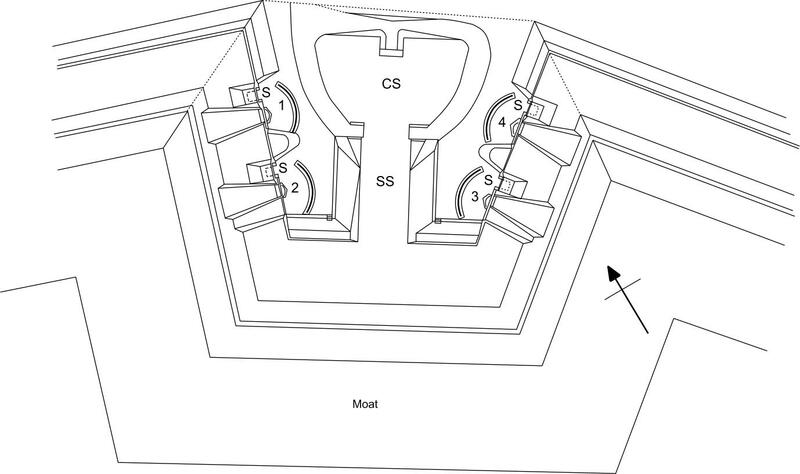 In addition No.2 battery was first armed on its two large sea-facing gun emplacements with two 64pr R.M.L. guns. these were replaced in 1886 with two large 7-inch 7 ton R.M.L. guns. In 1891 these were fitted to Moncrieff disappearing mountings that rose to a firing position using heavy counterweights and were then dropped down under cover beneath the parapet to load them in safety. In 1904 they were replaced by two of the latest coast defence 6-inch Breech Loading guns and the whole battery was modified to supply them with ammunition. 7-inch Rifled Breech Loading Gun. Requiring a crew of 9 men this was the weapon adopted for the flank defence of land front forts and for the Stokes Bay batteries. It had a range of 4000 yards using a 14lb charge for distant shot and 12lb for full shell. It fired a common shell for hard targets and case or segment shell for use against troops. The 7-inch of 7 tons was the standard flank defence weapon for coast defence batteries. On the Stokes Bay lines it was employed on the south face of No.2 Battery on Moncrieff mountings as there was not a dwarf platform available. 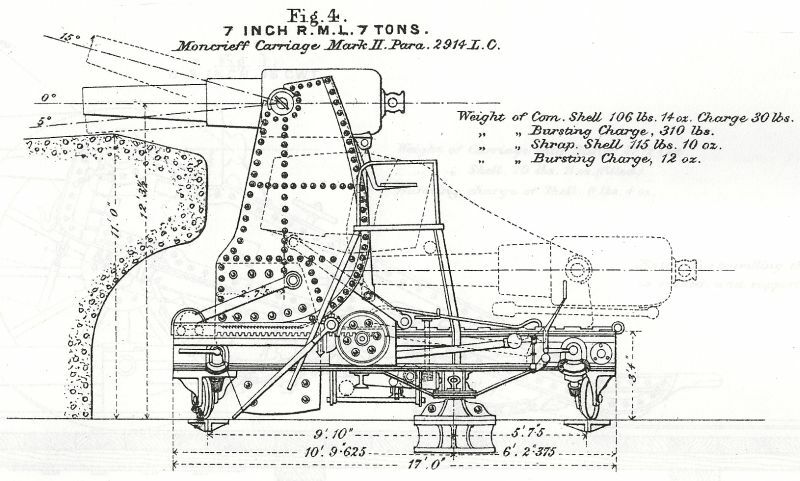 The Moncrieff mounting recoiled upon firing and in doing so raised a large counterwieght which could be used to lift the gun back up to the firing position after loading. It had a range of 5,500 yards using a 30lb charge and a common shell of 115lb. No 2 Battery later use. Gosport Borough Council purchased the Battery in 1932 from the Home Office for £1,500. In 1933 the Council approved the use of the site as a caravan park. 1939 the Council moved their records from the town hall to the Battery for safe storage. The Admiralty requisitioned most of Stokes Bay in 1943 as they commenced their preparations for the invasion of Europe. The western end of the Bay, including No.2 Battery, was used by the Salt Water Training School for crews manning Duplex Drive tanks. 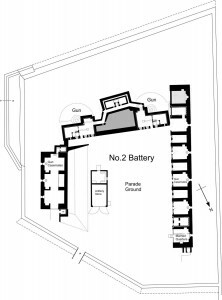 No.2 battery was retained by the military for a short while after the War as part of the Special Armament Development Establishment (S.A.D.E.) based in Fort Gomer. 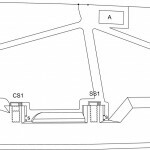 In 1982 No.2 Battery became Gosport Council’s nuclear bunker (Civil Defence Command Post) at a cost of £30,000 and a new passage was cut to connect the left flank casemates to the left magazine. Air tight hatches and an air filtration system were fitted. The left flank casemates were opened to the public by local volunteers for a short while in 1994 as a Summer Exhibition Centre. In order to do this the centre gun embrasure was converted to a doorway. In 2010 Gosport Borough Council were actively seeking a use for the structure, and the Historical Diving Society expressed an interest in acquiring it for a small museum to display their diving apparatus. The museum opened in 2011. The parade of the battery is still a private Mobile Home park. 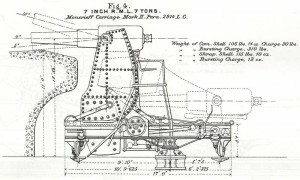 No2 Battery as it may have looked in 1903 with its two 6-inch B.L. guns. A drawing by Peter Watson. The Stokes Bay Lines and Batteries today. As artificial waterways they have no natural beauty and are not suitable for boating or fishing, the water looks dirty and uninviting and the annual maintenance is probably around £150 per year. When filled an area of nearly 17 acres will be added to the area for development a very valuable acquisition and will be used for tennis courts, bowling greens, car parks, rock gardens etc. Moreover moat filling will transform the area from Blunts Bridge to No2 Battery for to-day the area between moat and beach is just wide enough for a narrow road and no development can take place without expensive works that would encroach on the foreshore; with the moats filled, however, the marriage of the grounds of the Bay with those of Bay House and Alverbank is achieved and the extension of the promenade made possible with added spaces for gardens and sea chalets. The intention is to fill the moats with refuse so that the cost will be small in proportion to the advantages derived. Normally the whole cost of the recuse disposal falls on the Roads and Works but as I intend to make a special job of this work with at least 18 inches of topsoil covering. I propose charging the open spaces with part of the cost in order that the estimate for refuse disposal may not be over-expended. No2 Battery: For quite a long time ahead it can be used as a caravan park or camping site or indeed for any purpose which would entail little outlay I advocate the filling of the moats around the battery and the piecemeal demolition of the battery itself, when an area of almost seven acres becomes available for any scheme that appeals to the council. The moats were gradually filled with earth, rubble and refuse over a period of time from the 1950s to the 1990s as the Bay became more popular with visitors and the residents complained of mosquitoes breeding in the water. The ramparts were pushed into the moat. Today not a single section of the moat can be seen but its route is easily followed along the Bay. 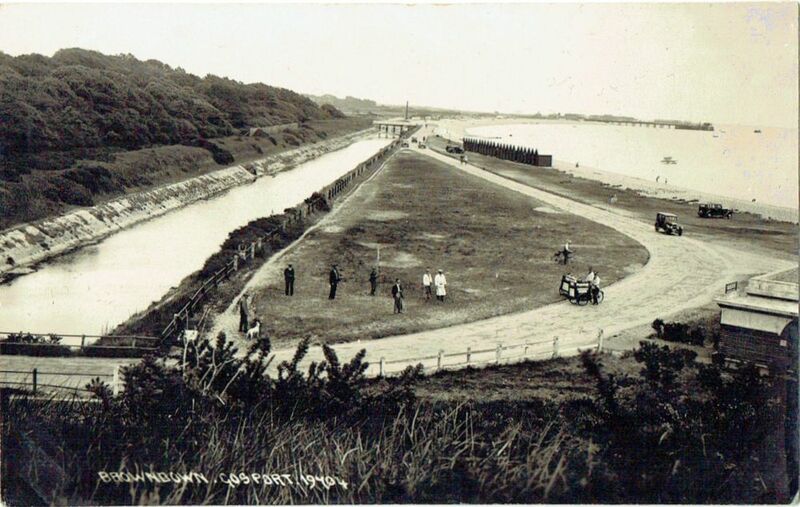 No.1 Battery was partially demolished in the 1930s to provided a road to Lee on The Solent. Parts of it still exist inside the mobile home park. No.2 battery is mostly intact and the east facing gun casemates together with the sea facing gun emplacements and magazines are now part of the Historic Diving Society museum, which is open to the public during the Summer season. Both No 1 and No.2 Batteries are Listed and protected. 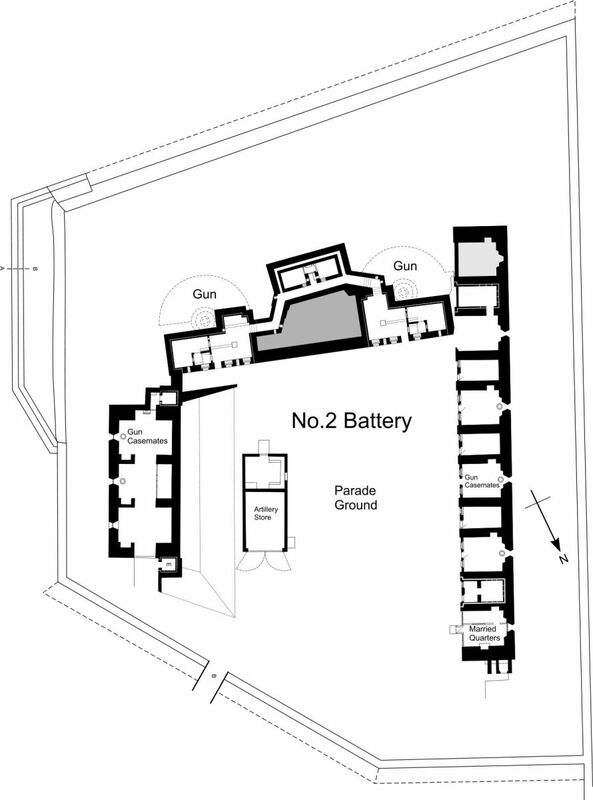 No.3 Battery has been completely destroyed and its site is now within a private garden. No.4 Battery has also been completely removed and no clue to its existence remains. No.5 Battery is scheduled as an Ancient monument and most of it survives, much altered, within the site that was once part of the Royal Naval physiological research centre, later taken on by QinetiQ and now empty and unused. There is no public access to it.